When I've had the chance I've been working more on my storyboards over the last few days. I'm struggling a bit with the decsion of how complicated to make the story. I have drawn so far up to the point where the Suitcase makes it onto the platform, out of the ticket office. I originally was going to have the suitcase climb out of a window, but I think that is over-thinking it, and creating more work than is needed for a simple scene. 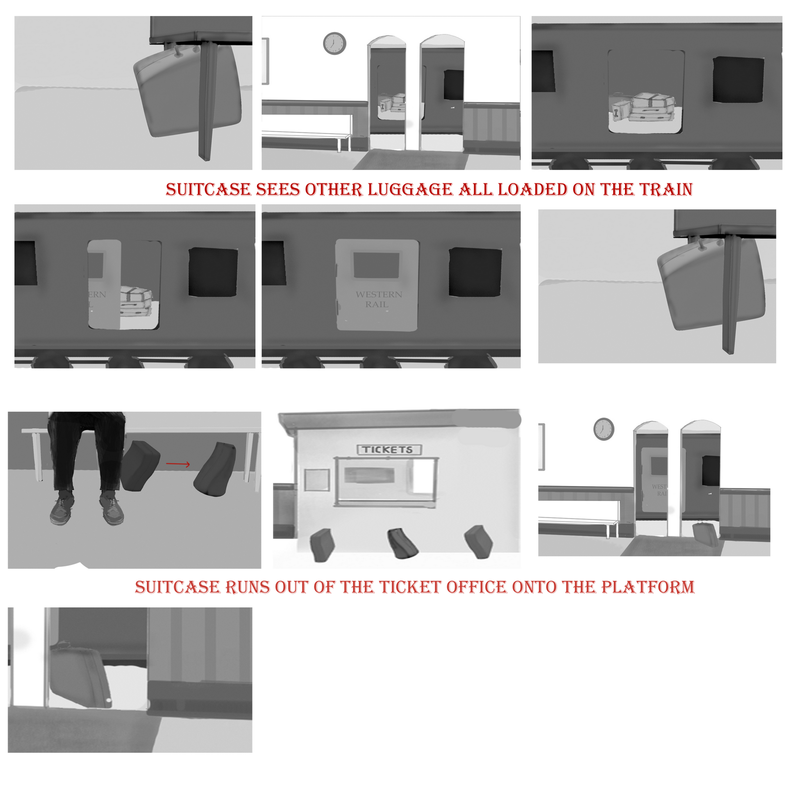 My new plan is to make these first few scenes as simple as possible so they can be easily understood and then when the suitcase makes it near the train, to create a lot more action. I'm starting to come to terms with the amount of modelling, texuring and animating that this short is going to take. Once I have the storyboards completed, I'm hoping to crack on with some Pre-viz alongside more concepts so I know exactly what to do in Maya, not to waste any time. The most complicated part of this all will be the train, I've got huge amounts of references from films for it and with a bit of patience I'm sure I can create it how I imagine. 1) Family Story: Make the lost luggage on the platform and on the train 'Matching Luggage'. Therefore the suitcase becomes a lost child for example. 2) Love story: Make one of the bags on the train 'Female' and the one on the platform 'Male'. ie the film Brief Encouter. 3) Harder story to tell: Make it an 'Ugly Duckling story'. So the 'lost luggage' is lost because of the way he is cruelly treated by the other bags - due to his shabby appearence he is 'hidden/ overlooked' by more important bags and staff. Finally, he is found and collected and we find that he has been carrying something precious inside the whole time. As I said this one is much harder to tell. Thanks Alan. I really like the sound of all of these. I think the 2nd Idea, with the female suitcase would fit well, I'll have a think about that today. I think it would make a better ending than I have at the moment, when they are re-united. Plus, it gives me the chance to make a hot female luggage bag. If you go for 'Love Story' it would be fantastic to go old school Black & White too. Particularly given the era and styling you've chosen. Watch the movie Brief Encounter for clues to animation / film making also. ie, posture, framing, cuts etc. You could really have fun with its 'retro' qualities.